Once again, Zombi Does good . The Undead will appreciate it. Thanks Zombi for the shout out! And great guide, it's good to know how Yorick and Hansuke do their thing and stay alive without the massive power of Brom's Soul Stealer heal or Zomm's just straight up damage to life regen. I think my setup is somewhat similar in terms of vamp + bulwark combos, but I'll probably tweak a few runes thanks to your guide. Quick question for anyone with an answer : MK is maxed in dodge, is there any way to avoid adding more dodge to him while adding crit/skl/atk ? For example light runes that enhance damage or crit always may give a dodge boost, resulting in a useless slot per rune. I don't want to equip MK with anything below 5*Legendary Greater runes, so it takes some gems/grind. That is why I don't want to blindly craft and tune runes hoping I don't get a dodge bonus. There really is no way to tell without crafting it. But only craft them to rare is what I would do. If they don't have dodge by then, take them higher. If they do, salvage them. It's hard to do, I know. I've struggled with it to. But it's really the only way. -Yellow and Blue precision runes with crit/att/dmg% or crit/att/crit as needed to hit crit cap, and then bulwark with def/hp/def. These three slots allow for some balance between damage and survivabilty, and is a bit or a personal choice. Keep rolling runes looking for those combinations. Junk any that don't match what you need. Using heroic or better greater runes in this way should get you to the neighborhood of 4,000 att/3,000 def/6,500 hp/50% crit. That's a solidly functional MK. 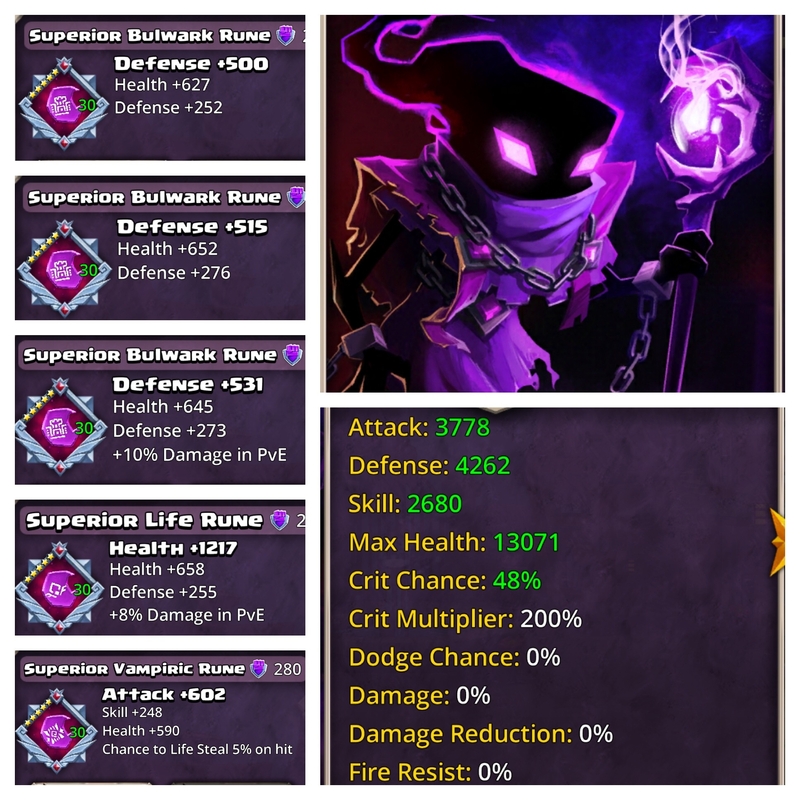 As you start grinding out legendary greater and superior runes, you'll upgrade that a little bit, but I've noticed his effectiveness has dropped off a bit at legend league PvP. We all still use him but I'm starting to suspect that is as much out of habit as anything else. Bauble hurts his value against armored teams, nicely runed shades and/or kozars will sometimes one-shot him before you can use him, he does middling damage against Emily, kozar, grog (some of the most common opponents), and aria / shadowblade frequently dodge him. He's still good on defense, but I'm getting less and less impressed with him on offense unless paired with aria/pignius for the damage boosts. >> Zombi has a good (though starting to look aged) guide to runing MK. Sorry...hard to keep track of who did which since we can't tell your voices apart. You can't tell our voices apart!? I think a fantastic change to the game would be, if you manage to beat @Zombi 's ghastly OP defense, he has to send you one of his gigantic pile of legendary superior runes. Even zen/kozar required some lucky dodges! That is a seriously hard to kill shade. If I could float an idea at you- runing a good lizard team would be really interesting to see, especially if the changes to PVP increases the viability of Viperia. The Undead and Goblins are the obvious teams but the Lizards have good synergy and buffs on paper- would like to see how you think they should be enhanced. Just a suggestion! I'll do just that when the revamp the reptiles - there's not much point in me doing anything on them right now. Cheers for the videos most appreciated. Good feedback - thanks for providing! So we kicked things off with out favourite heroes as we needed a starting point. The heroes you've included above will indeed get videos in due course, we're not just focusing on the big ones. The next two we'll do are Tsume and Astrid as these are what have been requested in the last week or so most frequently. One rate limiter for us though, is the fact runes take such a large chunk of gold to simply swap about. So it hinders our experimentation with an array of builds, and we have to go on what we've experienced so far. So duper late repost. However, this is exactly why gold cost to swap runes is a terrible for experimentation. @Zombi can we get more of these videos? Maybe a goblin team one and one for runes on a good lava academy team? @Starskream is still very much in the game, he's the GM of FINAL BOSS! Videos-wise, he's just been super-busy with RL, but I'm sure he'll get back on the case soon enough. As for further rune guide videos, I'm waiting for the devs to release their updates to the rune system. Hopefully it shouldn't be long before the update goes live, and once it does these will resume. I don't know about a video, but I can say what I did after I got that crit as high as possible - piled on the defence. Although it means you'll sacrifice some attack, purple Bulwarks are very useful. Personally, pump up attack on bramble and squinch, and defense on nub nub and zurk. The reason being, zurk and nub are your proc guys, who just flat out need to survive. Bramble and squinch will pile on the damage. This is at least how I auto run Savage Grove and Babel Mountain. For Permafrost, I swap squinch for a balanced bovus. Astrid guide? I know it's basically stack defense, but in slots like the green one, is it better to put a health rune with a defense line or an aegis one? 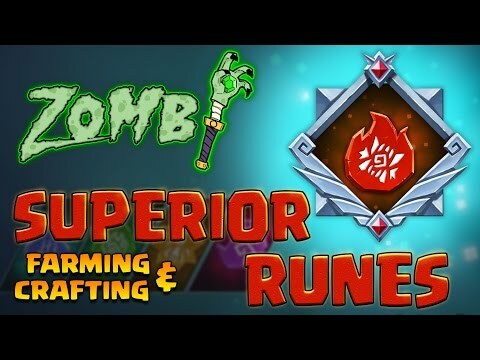 Not sure if you guys are still doing these (I noticed Zombi’s last upload was about five months ago), but could I request a look at Valkin and Hagrim’s rune strategy? I’m thinking about trying to make a feasible dwarf team for the current meta, and I at least need those two tip-top for it to work.